Hedgehogs have enchanted people for generations, and the woodland creatures are still a favorite with their sweet smiles and prickly outlook. 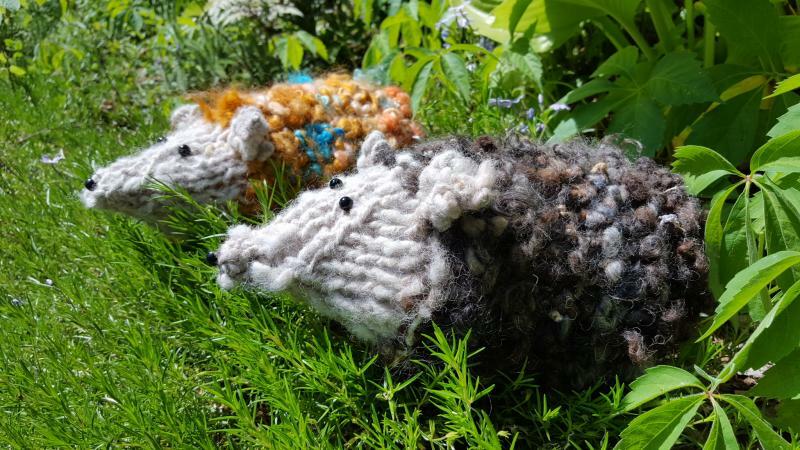 Knitting a hedgehog is a lovely way to spend the afternoon in the garden, where you will create a soft, huggable toy by sunset. The following pattern is suitable for beginners. All you need to know is how to cast on, knit, and decrease stitches. 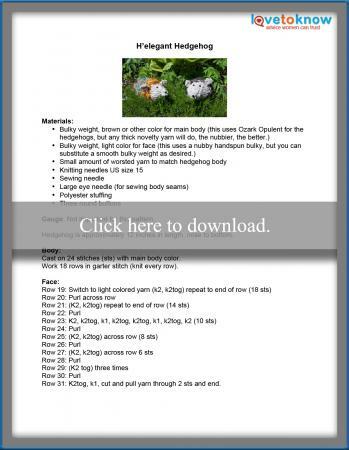 Click on the pattern image to download and print the instructions. You can find additional help by using this guide. Knitting toys is a delightful quandary since you get to choose from among many colors, textures, and materials, including handspun or embellished novelty yarn that will make your hedgehog one of a kind. Bulky, super bulky, and jumbo yarns all require different needle sizes and result in different gauges. The Craft Yarn Council has a chart to help you decide what yarn and knitting needles work best together. Novelty yarns can consist of different fiber types, like silk, wool, cotton, linen, and mohair. The yarns can also be spun with thick and thin sections, which creates nubs and a rough surface and gives your toy a bit of personality. Try Ozark Handspun or Spin City's handspun yarn from England. Tinsel, which is chunky weight, is from King Cole yarn and creates a prickly looking but soft fabric, perfect for hedgehogs. Fluffy yarns are very popular, and Caribou from Hikoo is bulky, soft, and used for toys and blankets. Nubby yarns are perfect for the hedgehog's face. There are yarns like Dancing Leaf Farm's hand-dyed Slubby, or Plymouth's acrylic Encore Boucle. If you don't know how to knit, there are many excellent sources to get you started. This slideshow has clear, easy-to-follow directions for casting on and knitting. Knit 2 together (k2tog) decreases the number of stitches on your needles and you will use that technique to shape the hedgehog's head and face. There is one seam in this pattern, which is easy to sew. Don't worry: the great thing about textured yarns is they hide any little mistakes. You will use a running stitch to close the back of the hedgehog, then pull it tight and knot it off. The hedgehog's body should be somewhat tightly knit to hide the stuffing; depending on your gauge, you may need to go down a size or more in needles. Purl Soho offers a sleek hedgehog pattern that is knit in the round with very little finishing. Ekaterina Sokolova has designed hedgehogs as wearable toys in the shape of mittens. This amigurumi hedgehog sports a scarf and happy attitude and is only a few inches tall. It's time to get knitting. No matter which one you knit, the result will be a delighted knitter, and an even more delightful hedgehog.